Just thought I'd share this little project I made for my AD.OR.AB.LE neice who just turned one! It was so simple, and turned out so cute!! Using my favorite iron-on image transfer paper (Avery brand), I found a photo of my cutie-patootie niece and printed it out on the paper. I cut it out and followed the package directions to transfer it to some fabric. Then I just made a little "pillow" out of it by cutting out two pieces of fabric and sewing them with right sides together. I then turned them inside out and stuffed with polyfil. I always finish by handsewing the opening shut with an invisible stitch. I made a very small pillow because I intended it to be an "ornament". But you can make them any size. I didn't add the ribbon, however, because I thought my sister might want to choose the ribbon to match her daughter's bedroom. Very cute! I've always wanted to try something like this. I've always wanted to make a pillow of my dog Allie! Thanks for the inspiration! LOVE this so much! The possibilities are endless! That is so completely adorable! I would have never thot to do something like that on my own! U are very creative! We have been having fun with those transfers later...your pillow is just too cute! What a wonderful idea...so cute! Wow - this is such a cute idea! I would love to do this for my neice. Does the transfer paper go through your computer - or is it an iron-on? You print the image on the paper using your computer, but then you iron it on to the fabric. That is the sweetest gift ever! oh my it is so cute... wow !!! Very cute! How could you not love it? So cute! You have inspired me! Quick question - when you print a small image like this on the transfer paper, how do you do it so that you don't waste a whole sheet? Do you print multiple images on the paper at the same time? or do you know if you can run part of a sheet of transfer paper thru the printer? Thanks! That is so cute! What an adorable gift idea. Precious!! I love how true to life the color is. I have tried the photo transfer paper before and my colors seem to change when I iron them on. Maybe I am keeping the heat on for too long or something...yours turned out perfectly!! I love doing these kind of pillows they make special gifts even more special. I made all of my Son and their wives a pillow using their wedding picture and ribbon colors to match their wedding theme. LOVE IT, Wendy! You're so creative (no surprise!) - and what a fun subject to transfer into a sweet pillow!!! I bet your sister loved it! Thanks for sharing Wendy, that's really clever and I've not seen anything like that before! What an adorable idea. The little pillow is truly a treasure. I love it and will give your project a try. Thank you so much for sharing it. What an adorable idea! I've been wanting to try transfer paper - thanks for sharing your favorite. I'm thinking that little ornament you made would be great for Christmas gifts, too. It's never too early to start thinking about them. You are so creative. Just adorable. Thanks for the idea! that is one special gift! nicely done! That's so cool! It turned out wonderful! That is so cute that you made it into an ornament. 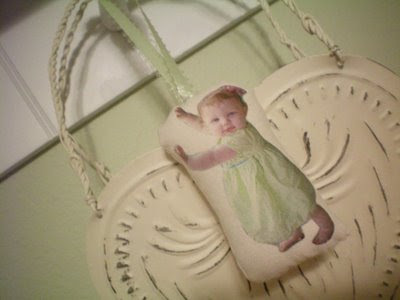 Great idea for Christmas ornaments. That is absolutely adorable. I love it. She is a cutie and it looks great hanging in her room! Cute idea! Thanks for sharing!